Tom Ford lizard and calfskin leather wallet. Bi-fold silhouette with money clip. 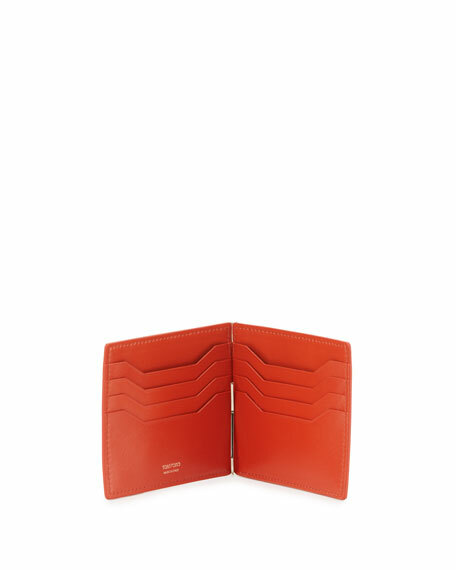 Fendi FF-embossed calf leather bi-fold wallet. Logo striped front. Two currency compartments, eight card slots, two slip pockets. 3.5"H x 3.9"W x 0.3"D. Made in Italy. Fendi wallet in signature FF canvas with leather trim. Logo embossed applique at front. Currency compartment, six card slots, two slip pockets. Made in Italy.